This was a timely tweet as I recently produced a video about Brighton and Hove Council failing to support retail businesses - particularly with their aggressive anti-car policies. The fact there are so many closed shops that the council 'decorates' to look better should be warning enough that all is not well. But the fact the council don't bother to record shop closures probably says it all. Skipping a load of background... (for now...) and getting right on with the current story/issue. A local school whose 'league table' position had slipped from solid middle to absolute bottom described this years results as 'a blip'. A F*KING BLIP !! - it maybe a BLIP for the schools stats and the local councils stats but is isn't a F*CKING BLIP for the kids who just left the F*CKING SCHOOL without DECENT QUALIFICATIONS. Sorry to be so blunt, but this really focuses 100% on something I despise about the state education system and the public sector in general. There are armies of people who think *firstly* about themselves and their position and only *secondarily* (if that) about the people/individuals they are supposed to be serving/delivering to. One of my boys could have been in that failed year - but a few years back we raided of our savings (our kids 'collage fund' our 'pension fund' etc) and took him out of that (clearly declining) school for a private school, a private school that had/has only one focus - to do the best for every single child in its care. Not a 'hot house' or for 'high flyers only' but a school that wanted kids who would fit in and that it could help be the best that they can be. It is tragic what has happened to the kids left behind at that failing school, and I feel for every parent who (for whatever reason) couldn't do what we did for ours, and may have had to watch their child meander into mediocrity instead of stretching towards their potential. Brighton and Hove schools and stupid 'lottery plus catchment areas' policy is a proven failure. And more widely 'Comprehensive education' is a failure, however long it goes on and however much taxpayers money is thrown at it, it can never, ever work. It is time to face up to is failure and either switch to a different, better new system - OR - switch back to a Grammar School system that we used to have and used to propel so many children from 'poor' families up the socio-economic ladder. There is no time to waste, kids are being failed right now - and a blip on government stats is a life time of regret for them. Brighton and Hove Greens (again...) - Showing ageism in libraries is alive and well. Brighton and Hove Greens are planning to ditch the mobile library service. I guess some people might have expected a bit more from a group who claim to be into sustainability, recycling etc... After all that is how some people still (naively) see the greens. Even I would expect more from such a group... But truth be told the 'Green Party' have nothing to do with sustainability, recycling, the environment etc... the environmental issues of the 'ecology party' are just a smoke screen they pay lip service to. The modern Green party are the same far left marxist 'socialist workers party' types who have leapt on each and every cause they can to impose their beliefs on all of us. The Green party have done a pretty good job on some of the residents of Brighton/Hove, even getting comfortable middle class people to vote Green and so support their own destruction. I guess the Greens getting in as a minority administration has done every one a favour - we get to see their true colour (deepest, deepest ideological red) before they have full power to implement their plans. Is the mobile library dead? Following on from my last damning of Brighton and Hove Greens for being blindly loyal to unfounded predictions - putting blind faith in bad guesses and getting it wrong (regarding the budget - their foolishness over 'man made global warming' is for another day!). The Greens' Jason Kitcat produced a council budget for two years, instead of the usual one year. In The Argus local newspaper I remember (but can't find the link) a report of Tory councillor Theobald saying it was not sensible to be setting a two year budget when it is impossible to know what could happen between then and now. I, myself, challenged Kitcat on twitter about this - pointing out the the existing 2.5% freeze grant (that Kitcat wants to reject) was only confirmed a short time before the budget was set - no one knew about it a year ago, let alone two years ago! So what might the future hold? Kitcat simply insisted that nothing had been announced for next year, so it was sensible to assume there would be nothing. Kitcat was further challenged on his crystal ball gazing by a local Labour activist - again to no avail. Now, it hss just been reported that the government are indeed considering additional grants *next year* to councils who freeze their council tax this year! Councils could be financially protected in the future if they freeze council tax this year, communities secretary Eric Pickles has hinted. Theobald didn't *know*, I didn't *know*, the labour activist didn't *know* - but we all recognised that you don't dump a huge bill on council taxpayers 'on the off chance'. Meanwhile, Kitcat didn't *know* either, but showed blind faith in his own guess - a guess that hammers local taxpayers - a guess that turns out to be wrong. When discussing voluntary charitable giving vs coercive taxation, an argument often put forwards in favour of taxation is "some people are selfish and would not give, so you have to tax them". My response is "So what if some people wouldn't give?". If we simply let people give as much (or as little) as they are prepared to give we will have the society we are willing to pay for, no one will be imposed upon, and no one will be robbed of the opportunity to be as charitable as they wish. The same extends to the allocation of general taxation for essential state duties - such as defence, justice and market regulation. If there are people who don't want their taxes going on the UK's nuclear deterrent, then why not let them have their taxes spent elsewhere? I'd be happy for more of my taxes to go to our nuclear deterrent and have less spent on the areas that are already covered by the those who don't want to pay for our submarines. The idea that 'everyone' must be made to pay towards 'everything' is simply bogus - based on the patronising view that taxpayers are cattle the be herded by their 'betters' and incapable of making their own choices/decisions. It causes friction, encourages evasion and suits no one. Many people like taking drugs - many drugs mimic natural body chemicals/responses that everyone enjoys as part of the way we naturally function. If someone enjoys a film that you don't like or a joke that you don't 'get' - do you resent them enjoying the film/joke? Well I guess you won't be bothered about the film, but might resent not 'getting' the joke, and be demanding to know what is so funny. It seems to me that this (jealous/resentful feeling when not getting the joke) is the cause of much anti-drug feeling - that some people can be having a 'good time' that the anti's don't share in. The difference between not getting a joke and not taking drugs is that the latter is most likely through fear - a fear of being out of control, a fear of getting addicted, a fear of what others may say/think, a fear of the law. The anti's are angry out of frustration at the conflict of wanting a 'good time' but not being willing to 'pay the price' - and jealousy of others who are prepared to do so. The anti's are fundamentally unhappy with their lot, because their efforts at happiness can by surpassed simply and cheaply - but only by taking a risk that they dare not take. I am not anti-drugs, as I am not angry, frustrated or jealous of those that do; I am not pro-drugs because I don't think they are essential to be happy. One thing that does amuse me is observing the anti's tie themselves in knots as they try to create new and ever more bizarre, disjointed reasons to pretend that their attitude is based on anything other than their own internal conflict caused by their puritanical prejudice and bias. What has been done so far on UK drug policy is clearly not working - its time for a complete rethink, and a radical change. Brighton and Hove Councillors - Fools and Felons - Alcohol Minimum Pricing. Pubs in the UK have recently been shutting at unprecedented rate. Parliament recently passed a motion in support of the British Pub - supporting proposals intended to reverse the decline (or at least slow it). So they want to 'address disparity' in pricing - but not by bringing pub prices down, but by pushing shop prices up! Who are these guys working for? who do they represent? in whose interests are they really working? Why do they say they want to end disparity? They say it is to encourage people to drink in the 'safe and regulated' environment of a pub. Well I can't speak for everyone, but I don't think there are many normal people who would feel safer in a pub than at home! Green Energy Policy - A Return to the Dark Ages and War. Giving society cheap abundant energy is . . . like giving an idiot child a machine gun. Recent developments mean we now have access to more energy resources, in more locations, than we ever imagined. There is believed to be more energy in deep sea methane alone than in all other carbon sources (oil, coal etc) put together. These energy resources are vast and spread all around the world. Energy supplies are one of the major causes of military and political conflict in the world - most recent military adventures by the US and UK have been accused of being based on greed for oil rather than humanitarian or political issues. Another source of future conflict is supposed to be water - for both drinking and irrigation. With cheap energy, there is no limit to the moving of water around the continents of the world, nor to water purification and desalination. The whole world could be on the edge of a new revolution - a revolution of cheap, conflict free energy. If this revolution is well managed this could lead to a new golden age for all mankind. Such a new golden age would not be universally popular - there is a long (twisted) tradition of self-flagellation, guilt and puritanism in western culture - a philosophy that says mankind deserves to suffer and struggle and that an easy life is bad for 'character'. Sometimes this 'guilt' philosophy is genuinely held, other times it is just a tool of the ruling class to keep the subjugate others and keep them in place as a servant or peasant class. Amongst others, the Green party are fully signed up to this guilt based philosophy - whether all of their supporters are aware of it or not. They argue against accessing this new golden age, they say we should turn our back on this cheap, abundant energy, they argue for a return to small local community (tribal) living, based on hard labour. Had they been around in the stone age, mankind would still be in the stone age and the Greens would have celebrated this achievement. We must reject the obsolete philosophy of 'mankind is bad and deserves to be punished'. We had almost put it behind us with the decline of widespread support for churches preaching 'guilt and original sin', the Green movement is working hard to revive it. But it will result in more and continued conflict, suffering and poverty - we must simply say NO to these bizarre siren voices. Pretty much everyone supports a clean environment, conservation of natural resources that are limited and cannot be replaced etc - but the Green party are not about these 'apple pie and motherhood' issues, they are about controlling and suppressing mankind. Don't be fooled by them. The state undermines 'community cohesion' simply by getting involved. Social Cohesion: The state isn't part of the solution, the state is the cause of the problem! During a water outage that lasted a number of days, some old folk were complaining about the number of times they were having to answer the door to people offering to get them water from standpipes/tankers. They had every pot and pan full already, filled by earlier helpers. When you hear about communities falling apart, old folk freezing, starving, dying and not being found for weeks - what was happening during the water outage? Simple - many people like helping, they are happy to help - but when the state steps in and hijacks that responsibility (along with their dodgy 'third sector' hangers on) people are deprived of the opportunity. The state has taken responsibility for looking after people in most situations, so other people let them get on with it - the state destroys community spirit, community cohesion. However, when exceptional circumstances arise (such as the water outage) people seize the opportunity to 'help', 'feel useful' and 'make a contribution'. People would help more, be more community minded if the state got out of the way - stopped usurping the role and stopped taking our money to pay for it - with less done by the state, and so less cost, taxes would be lower and people would need to work fewer hours and have more time to be community minded - just as many already want to be. Other examples of people seizing the opportunity to help, beating the state to the job, were the clean up after the riots, and during snowy periods when council gritting fails - many people get out and make paths safe. The state isn't part of the solution, the state is the cause of the problem! Having spent significant amounts of council taxpayers money, and consumed a vast amount of public time and effort, the Green led Council has come clean and admitted that the figures in their budget were wrong. In a hugely embarrassing u-turn Jason Kitcat, the green councillor behind the budget was forced to confess that there was considerably more money available to the council than he had said in the budget proposal, and many of his proposed cuts (that had been the source of much expensive and time consuming debate) were entirely unnecessary. This new information came to light only after an extensive period of consultation and debate. Unfortunately that debate only engaged a very small niche of the Brighton and Hove taxpayers, but was at considerable expense and time consuming for the few who did participate. This embarrassing Green confession also calls into question a fundamental and key element of the Green councils budget policy. Kitcat has declared that he is setting a two year budget to provide 'stability', this policy has been seriously challenged from many quarters (Labour, Conservative and UKIP) - especially as it forms the basis of the Greens decision to reject 2.5% budget increase from central government, an instead demand a 3.5% increase in their charge to Council Tax payers. As this episode shows, the Greens got their figures hugely wrong over the one month budget consultation period - how on earth do they believe they can accurately predict figure over a two year period? Council taxpayer being landed with a projected 10.5% rise in council tax will be asking what credibility the Greens still have on finance... if any. Migration and Unemployment - do migrants take jobs from UK citizens? There have been two reports just released on the issue of whether immigration damages job opportunities for our own citizens. The Migration Watch document has been reported in various places, with opposing comments from the NIESR and ASI (The Adam Smith Institute - a free market, business oriented think tank who would tend to support business having access to cheap labour). NIESR - and its flawed question. The NIESR report is actually looking at whether a company taking on a migrant worker will automatically sack an existing UK employee. Literally 'do migrants take UK workers jobs'. This is a very narrow and odd question to ask, but there are some obvious reasons that NIESR might prefer this question to the really important question of 'would more UK workers have jobs if there were fewer migrant workers'. The NIESE question and approach is cleverly crafted as it would only detect large scale and hugely clumsy acts of employers simply sacking their UK workers and replacing them with new migrants, and it would not detect the issues that have causes uproar in the past. What the NIESE study completely hides is new jobs being created and going to new migrant workers, rather than going to our existing unemployed citizens. So the NIESE study is designed to miss the very issue that caused such a stir in june last year - "British Jobs for Migrant Workers" http://www.dailymail.co.uk/news/article-1284568/British-jobs-migrant-workers-Figures-ridicule-Labours-employment-pledge.html). Why is it such an issue that new jobs are going to migrants rather than our own unemployed, and such a devious distraction for reporting of this study to imply otherwise? Because the economy is in bad shape and we need to GROW the economy to fix it. As it grows, new jobs will be created, but if those new jobs go to new migrants rather than our own unemployed, we will not get the benefits of that growth - and the economy will never recover. If we are to cut our welfare bill by getting people back to work migration needs to be properly controlled, we can't let the left continue with their lies which they are now so wedded to that they can never face the truth. Everyone in the world wants a better life and no one can blame them for trying to achieve one. But migration has to be on our terms - when it is for the benefit of UK citizens - maybe for skill shortages, specialist skills etc. Not purely for the financial advancement of foreign workers at the expense of UK workers. A government has sovereignty over a particular piece of land, and has an absolute duty to put the interests of the citizens of that land above all other interests - that is what governments exist for, and why citizens entrust them with sovereignty. While our own government is not putting our own interests first it is betraying us all. (ps. Migrant vs Immigrant - these words seem to be used interchangeably now - for the avoidance of doubt, in this article, they refers to people who are not citizens of the UK, it is not a reference to where they were born, or other citizenships they may have had in the past). On the face of it 'citizens income' seems rather socialist and collective imposition on the public (who after all will ultimately be paying for it), but if we are to accept that, regardless of anything, people aren't going to be left to starve on the streets, it does seem the most efficient way of providing basic sustenance for all citizens. Every UK citizen would receive a regular payment from the government - no means testing, just a fixed sum with no strings. This would be simple to process. The sum would be sufficient to cover basic 'living' expenses. So for the unemployed, no additional benefit would be payable - the 'citizens income' would replace job seekers allowance and housing benefit. For the employed, there would be no 'tax bands' and no 'tax free allowances' - instead they would receive the citizens income to replace their tax free allowance. All income would be taxed with one tax at a fixed rate - this would replace the existing National Insurance contributions and income tax. This rate is likely to be around 35%. Because the tax rate is flat, and because everyone receives citizens income regardless of other earnings - there is no 'benefits trap' everyone would 'take home' 65% of every pound they earned/were paid, in addition to their full 'citizens income'. Who pays the 'Flat Tax'? Once in place, every company would be paying 35% of everyones pay to the government as tax - so why bother to track individuals tax payments at all? If a company had a total payroll bill of (say) £1,000,000 per month - it could simply pay 35% to the taxman (£350,000) and then distribute the remainder (£650,000) to its employees 'tax paid'. How about setting the salary 'flat tax' and 'corporation tax' the same rate? If this were done, then a companies profits (income, less costs except payroll) could be taxed at that rate (say 35%) and the remainder would be 'tax paid' and could be distributed to workers as pay and share holders as dividends with no further tax to worry about. A huge part of the UK tax system would simply disappear. The citizens income would only be paid to UK Citizens, so there is no room for 'benefits fraud' there and a company would be paying a flat tax on all its profits, so there is little scope for evasion there, finally as all payroll is taxed at the same rate and paid by the company, there is little scope for companies to commit fraud/evasion, and no scope for individuals/employees to do so at all. During the switch from our current taxation system to the new one, peoples 'take home pay' would have to be protected - it is a 'simplification' not a tax raising exercise, so people currently paying higher tax rates would actually have their 'gross' salary figure cut, while people on low pay may have their 'gross' salary increased - however every one would continue to 'take home' the same immediately after the switch over as they did before, so there would be no hardship and no windfalls! There would be massive savings to be made in the existing civil service that handle taxation and there would still need to be some level of 'benefits' or 'social security' for those with various special needs. Some people may choose to do nothing and scrape by on their 'citizens income' as their only means, but many would also be in a position to try to start new businesses, or do voluntary or care work for others, while yet others will be content to just carry on working at a job and receiving their pay to live a bit better - getting 65% of every single penny they earn from the first to the last. 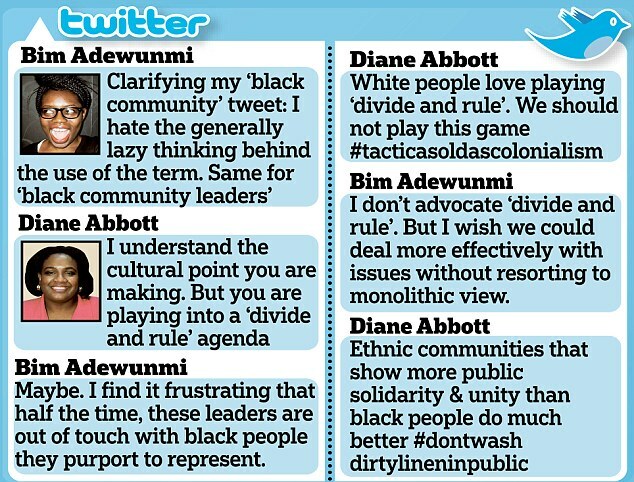 Dianne Abbott's racsim and the real damage it does. Different cultures work in different ways (or they wouldn't be different cultures) but the culture someone chooses to follow/adopt is a personal choice, entirely within their own power - not governed by the colour of their skin. Dianne Abbotts tweet, on its own is literally 'taken out of context'. The context was a discussion on how black community communities and black leaders are presented in the media and to politicians - asking what a 'black community' is actually supposed to be, and so who/what those 'leaders' are supposed to be representing. In this discussion Abbott rebuked the other participant for asking if the the term 'black' on its own was meaningful. Abbott suggested that was a valid line of discussion but that it should be kept quiet/private (don't wash dirty linen in public) and was a line of discussion that 'white people' like using to oppress others. So 'in context' the tweet is (if anything) more racist than when taken out of context. Its impossible to 'know' what someone else really believes - but if Abbott is judged by her words, she is undoubtedly a racist. I think applying this title to Abbott is disingenuous - as her purpose does not seem to be 'equality'. Her purpose is the advancement of those she considers to be 'black people', whether this makes them equal to others or not doesn't seem to matter one way or the other, as long as they advance others can 'go hang'. And if you happen to have a black skin, but don't consider yourself primarily a 'black person' then you really better watch out for her ire. In the past the KKK and the Nation of Islam cooperated on the basis that they both supported a division of the races - the heavy-weight boxer Muhammad Ali addressed a KKK meeting. Abbotts racism, drawing a line between 'black people' and 'white people', is no different. In todays Sunday Times Rob Liddle (a humorous columnist, so with some comedic licence) quoted an earlier Dianne Abbot quote where she suggested that black mothers worked harder for their children than white mothers - Liddle suggesting they have to 'because the black fathers are nowhere to be seen'. As a joke about a stereotype it may be amusing, but if taken at all seriously is offensive towards the millions of black fathers do take responsiblity for their families. Abbott's comments as a politician is what maintains this kind of humour. Abbotts racism gives licence to all racism - the colour of her skin should make no difference to how she is judged. Many thousands of women (and men) paid for cosmetic surgery - the surgery was regulated by the UK government, the quality control of the equipment and implants used was regulated by the UK government. It now transpires that the government regulation was completely incompetent. This regulation has cost every single tax payer money, and this regulation has caused damage - people trusted the surgeons and surgery because the government approved the process and its quality control. Apart from the regulatory failure, there is the plain 'health' issue - a person worried about a 'lump' will be treated by the NHS with a sense of urgency - a woman whose mental health is threatened by a pregnancy will get a termination on demand. How is a persons worry about an implant any different to the worry caused by finding a 'lump'. When a significantly large group have an identical problem, isn't that exactly why people accept and support governments acting 'in the public interest'? Action is needed now - the lawyers can sort out the compensation, insurance etc later - many peoples health (physical and mental) is at risk, we have the resources to fix this problem very quickly, and the resources to chase the guilty to the ends of the earth to pay for it *afterwards* with interest. The Stephen Lawrence Story - media and political manipulation and myth. Firstly... this isn't about Stephen Lawrence as a person or his murder or his murderers, rather it is about the story that politicians and the media created based on those events, and used to manipulate public opinion. This blog entry isn't even about whether that was a good or bad thing generally, its just pointing out that it happened. I could preface this with mealy mouthed waffle on about tragedy, awfulness, pity, struggle etc - but you can pluck a para or two of that from any number of news websites, so take it as read ok? The story that has been presented to me over the past 15 years based on this event - and many other 'equality' stories - has been this is some one just like you except in one vital detail, that one detail being the thing that the public are told they are prejudice about, that one detail being something that the equalities industry are making money out of, and politicians are making political capital out of. In this story the victim is a Londoner, a youth, out one evening with a friend - just like any other London youth might have been at that time - someone you could relate to, empathise with 100% - but he is murdered for one reason, the one thing that makes him at all different to you, that one reason is the colour of his skin. He is you, you are him, except for this one simple difference. But, after 15 years of this story being repeated over and over and over exactly as first told, suddenly new information comes out, information that changes the 'just like you' part of the story, no reason is given for this information not having been given before to make the story more honest. Rather it seems the story has served its purpose, and now there are more newspapers to sell so that story doesn't matter any more. It turns out that the victim was not 'just like' any other London youth, not someone solidly bound to the city or even the country - he had seriously considered moving out of the UK (back?) to Jamaica where his parents came, a place he had been taken to as a baby, moving there to work, and it turns out that his grave is actually in Jamaica too. Was he British? Was he Jamaican? A murder is a murder, but misrepresentation is still misrepresentation. As I said at the start, this isn't about Stephen Lawrence as a person or his murder or his murderers - it is about the misleading story the public have been fed about who the people involved in this incident are/were. Why did the 'story' leave out so many facts to paint the particular picture it did? Presumably to get additional public sympathy, dishonestly exploiting the empathy of the British people. I think you can forgive a family doing everything in their power to get justice, but the police? the politicians who have been grandstanding and band-wagon jumping and used this to manipulate the public? and the media (papers and television) delivering the politicians message (or their own hidden agenda), instead of the honest facts and news? p.s. I am blogging this because I feel deceived - why should you care? Well if you don't care that's fine, bye, its no skin off my nose. p.p.s. Any comments not based on the content of this post will simply be deleted - there are plenty of other places on the internet to publish unrelated stuff.